Unroll 1 puff pastry on a floured work surface. Spread jam in center of puff pastry. Place brie on top of jam. 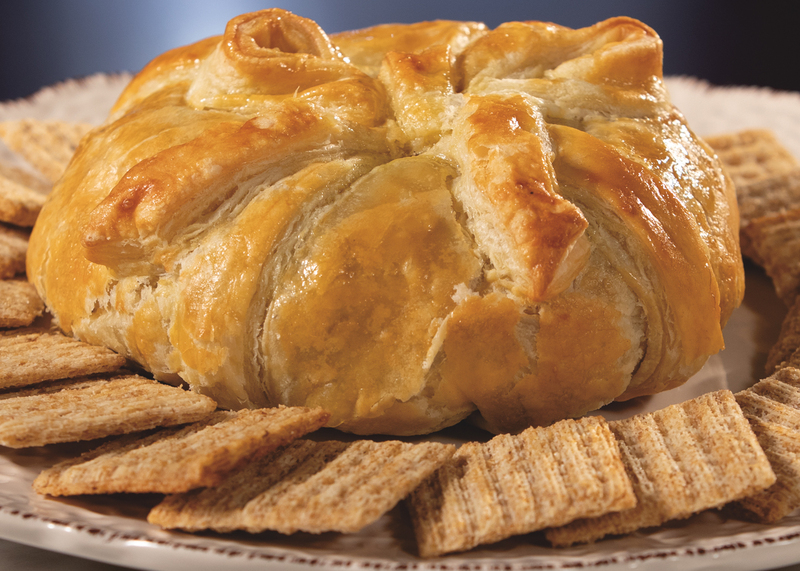 Fold corners of pastry around brie like you would a present. Seal with egg wash.
Cut second sheet of puff pastry into strips. Wrap two long strips around brie to create base of bow. Cut long strip into smaller pieces to create ribbon for bow. Seal onto brie with egg wash in a bow shape. Place brie on a parchment-lined baking sheet and cover all over with more egg wash.
Bake until deeply golden, about 15 minutes.